This is a one-woman, tour de force musical and theatrical journey, starring acclaimed jazz vocalist Stevie Holland. 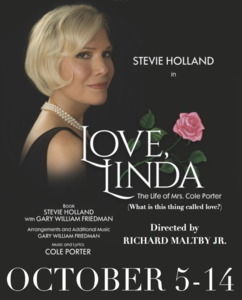 LOVE, LINDA, tells the story of Linda Lee Thomas, the Southern beauty who married and was a driving force behind legendary songwriter Cole Porter at the dawn of the roaring twenties. Though Cole Porter was gay, their companionship and love lasted through 35 years of marriage and together they lived a spectacular, glamour filled life. The score for LOVE, LINDA includes such beloved Porter songs as "Night and Day", "I Love Paris", "In the Still of the Night" and "Love for Sale." This is directed by Tony award-winning Richard Maltby, Jr.